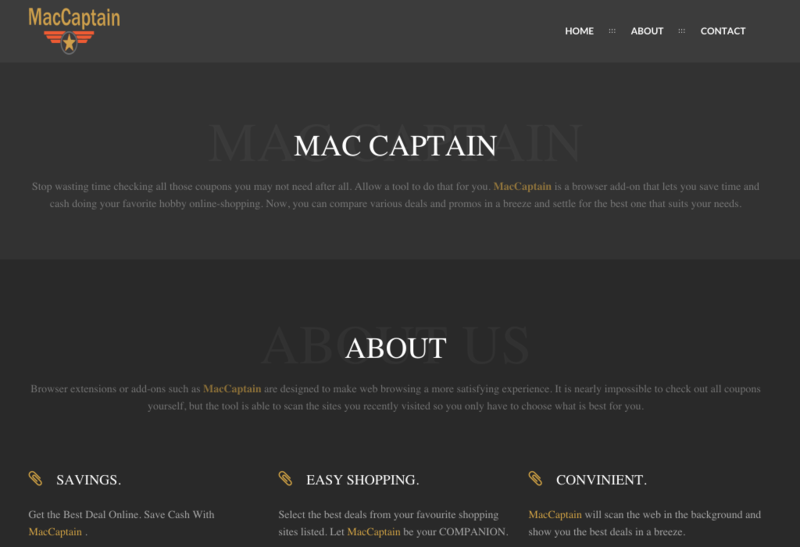 MacCaptain is advertised as a program that displays coupons for sites you are visiting and competitive prices when you are viewing product pages at sites like Amazon. Though this may sound like a useful service, the MacCaptain program can be intrusive and will display ads whether you want them to or not. When installed, the MacCaptain browser extension will display advertising banners, pop-up advertisements and in-text ads, stating that they are brought to you by “MacCaptain”. These ads are aimed to promote the installation of additional questionable content including web browser toolbars, optimization utilities and other products, all so the MacCaptain publisher can generate pay-per-click revenue. – Advertising banners are injected with the web pages that you are visiting. – Random web page text is turned into hyperlinks. – Browser popups appear which recommend fake updates or other software. – Other unwanted adware programs might get installed without the user’s knowledge. How to quickly remove MacCaptain? Scan your computer with Macware Adware Cleaner for Mac. Adware Cleaner will free your computer from annoying adware (e.g MacCapitan), malicious hijacker programs and unwanted toolbars. If there’s an item named “vindinstaller” in the Applications folder, or any other item that you don’t recognise, delete it.